Stuart and I got to Hampton about 3:00 with a good southerly blowing. Stuart rigged his kite in lightning speed and was out past the breakwater in no time having a ball. 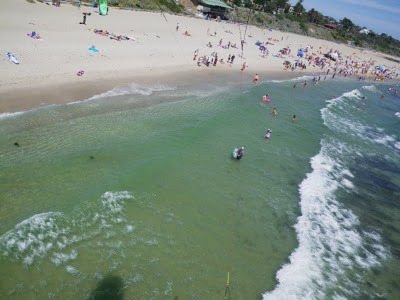 I set up my kitecam rig then took the 10m kite to the crowded beach. 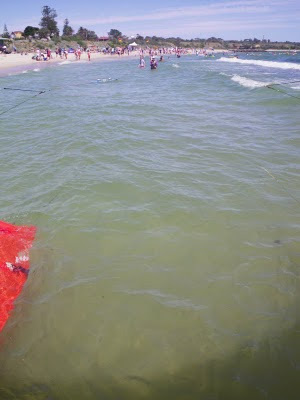 It was hard to launch as the wind dropped; I couldn't get off the shore so I aborted the takeoff and waited on the beach. It was weird; it seem the strong wind was coming in and stopping about 100m from the shore. Some others with bigger kites were occasionally getting going off the beach. Others were trying in vain to get 12m kites going, and there were a few times kites dunked in the water close to swimmers. 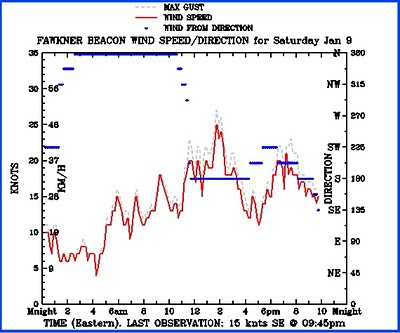 If it is a nice day and there is not around 20knots of wind on the beach, Hampton can become a problem for kiting. If you are a beginner, don't practice close to the shore on days like this. 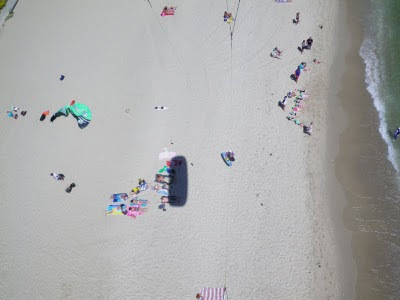 The close proximity of kites to beach goers is not a good idea. Tarren got out and going on his 13m pillow case (a Peter Lynn foil kite). 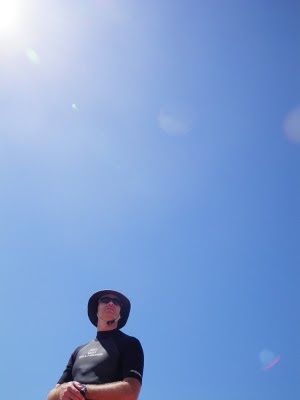 Eventually I decided to give the 14m kite a go, and was able to get going. After a couple of tacks - and some feeble attempts at a back roll - the wind dropped below 15 knots so I headed downwind past Middle Brighton, just clearing the point. The reef on the other side has some fun waves but is shallow and very rocky. Approach it with caution. 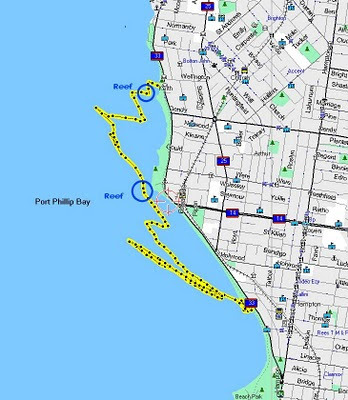 I did a few kite loops and got a big boost even in the light wind, and made my way towards Brighton, coming in where there were quite a few kites idle on the beach. There were no kiters on the water. I stashed my gear at the Brighton LSC then started the long trot back to the car. Halfway Stuart drove past - a welcome sight. 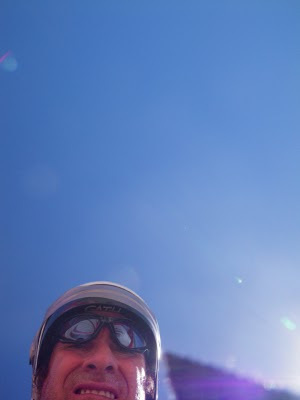 We retrieved my gear, had fantastic gelaties, then headed home. My right arm was again a bit sore near the elbow. It is muscular I think. 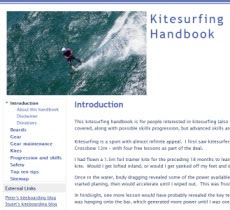 You can't have too much strength in your arms and fitness for kiting. How do I turn this interval shoot mode off? Downwinder track - watch those reefs! Are those Oakley WaterJacker sunglasses you've got on? No, they are "Ocean" watersports sunglasses - considerably cheaper at around A$70. They work well; stopping both glare and spray. I have just superglued on lens back in and the strap mounts which came loose. About 15-20 mins before you guys arrived a 12m Cabrinha launched in between beachgoers, made it to the zenith and then BANG!... the leading edge burst and the kite flopped down to the ground just in front of a couple of girls. Moments later I self launched my Peter Lynn 'doona/pillow/matress' and realised that in all the confusion of the burst bladder I had either neglected to connect the fourth line or it had come loose on take off. The doona went up, turned to the right and kept going, straight back down in a big arc. It landed on the grass at the top of the hill. Luckily no one was on the path at the time otherwise they would have been wrapped in a big soft cushion. Needless to say I didn't relaunch again until I had checked, double checked and triple checked the lines were all attached. Was a very interesting session yesterday, as you described in the blog. Tarren, double checking lines and gear is an excellent idea when locations are crowded. 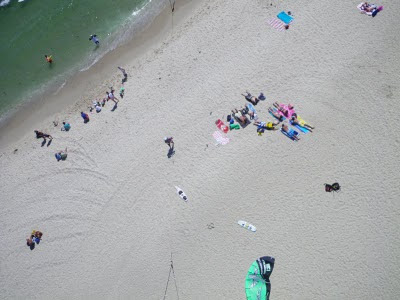 I was concerned about the mix of less experienced kiters and sunbathers on the day. 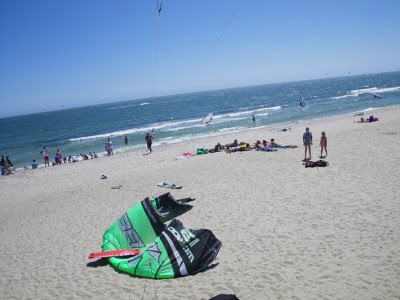 Memo to KBV: Please a get the kitesurfing etiquette sign up at Hampton that has been promised for over 2 years now!